The Montanus company was founded in the 1920 in Solingen, Germany. Following WWII, it produced cameras for a relativley short period of time. The company started making horn products, eventually updating its production to artificial resin products and plastics. In the early 1950s, Herbert Potthoff decided to apply these techniques to camera production.Montanus Kamerafabrik started production as Potthoff & Co. in Solingen, West Germany. 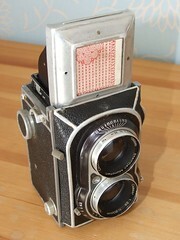 They produced a number of TLR and 35mm compact cameras until 1960. The company name was also spelled: Montanus-Camerabau - Potthoff & Co., Solingen-Ohligs. The companies experience with plastics was used to make camera bodies. Other elements as lenses and shutters were supplied by other German manufacturers (Rodenstock, Enna, Staeble and Steiner lenses, and Gauthier Vario and Prontor shutters). Later in the 1950s, the decision was made to focus more on 35mm cameras. To get more technical camera building experience into the company, technicians from Dresden, GDR, were employed. In the early 1960 Montanus/Potthoff couldn't keep up with the (Japanese) competition any more and gave up the camera production. The company however, continued to exist until 1978. Article in Photo Deal 2003/IV p 4-8. [Photo Deal] is a German language Camera/Photographica magazine with in-depth articles. a sketch on Montanus Kamerafabriks history. Montanus products at the 1956 Photokina (archived). This page was last edited on 29 January 2018, at 06:14.